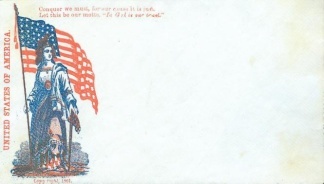 1861 Civil War patriotic imprint with full color vignette of Columbia holding a sword and an American flag, etc. Motto at left edge, "UNITED STATES OF AMERICA" and above, "Conquer we must, for our cause it is just. Let this be our motto. In God is our trust." "Copyright 1861" imprinted below the illustration. Light staining at the corners.